Renowned locally for the quality of its cuisine, the friendly welcome and professional service, Spices is attracting not only Datchet residents but diners from further afield. The restaurant is comfortable and attractively decorated with modern, clean lines and a relaxed ambience. The menu reflects the wide range of dishes the sub-continent has to offer and the wine list has been specially selected to complement the variety of flavours found on the menu. The finest Indian food and reasonable prices have made this restaurant the perfect venue for those wishing to savour Indian cuisine at its best. Established 14 years, Spices restaurant has one of the most attractive and original menus of any Indian restaurant for many miles around. 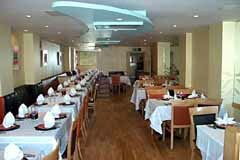 This is evidenced by the fact that a very high percentage of the regular diners are prepared to travel from Reading, Maidenhead, Burnham and Windsor to enjoy the true taste of this superb cuisine. This very tastefully decorated restaurant has a major emphasis on comfort, with professional and very friendly and welcoming service. With so many of the diners being regular customers, most are greeted as friends and made to feel very welcome. The fully stocked bar supplements the attractive wine list and offers a range of both bottled and draught beers, soft drinks and spirits. Being located on the green within this beautiful Berkshire village, the outlook from the restaurant is colourful and interesting. As will be seen from the menu, the selection of dishes is interesting and mouth-watering with most of the items conforming to traditional methods of preparation and cooking. True to the tradition of the Indian sub-continent, the menu provides a range of delicious vegetarian options for your enjoyment.